In somewhat of a surprising move, Rajon Rondo has decided to withdraw from the United States basketball team. Rondo told USA Basketball President Jerry Colangelo that he had some personal matters. Translation: Rondo saved himself the embarrassment of being cut from the squad. The Boston Celtics All-Star point guard saw the writing on the wall and knew he was one of the players on the chopping block before the Team USA announced its final 12-man roster prior to the start of the 2010 FIBA World Championship in Turkey on Aug. 28. Rondo struggled in a win against Lithuania over the weekend and didn’t play against Spain on Sunday. He pulled out of the squad following the Americans’ arrival in Athens, where the U.S. took on Greece in an exhibition game on Wednesday. Team USA rolled to an 87-59 victory over Greece, a team the Americans could potentially meet in the knockout round. Rondo’s exit means Team USA has its final 12-man squad, with Derrick Rose and Chauncey Billups now expected to get the majority of minutes in the backcourt with Stephen Curry, Russell Westbrook and Eric Gordon coming off the bench. The rest of the team includes Kevin Durant, Rudy Gay, Lamar Odom, Danny Granger, Kevin Love, Tyson Chandler and Andre Iguodala. 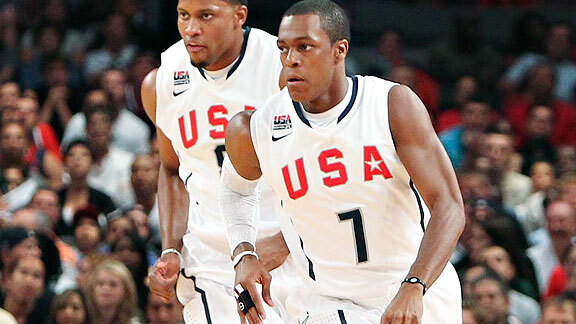 With Rondo out of the picture, the door opens for Westbrook and Gordon to have bigger roles for the U.S. Both men have played their way onto the team and their hard work is now being rewarded. Westbrook, Durant’s teammate with the Oklahoma City Thunder, is a great on-ball stopper, and his defense will be needed against Europe’s best guards. Gordon has been a pleasant surprise throughout training camp and the exhibition tour, showing the coaching staff that he can knock down open shots and able to play through contact off dribble penetration. Curry is the hybrid guard on the team, able to play point or shooting guard. His outside shooting will come in handy against zone defenses. Billups has started every game for the U.S., and seems to mesh well with Derrick Rose. Billups can slide over to the shooting guard spot when Rose has the point, giving Team USA two PGs in the starting backcourt. Rose played extremely well in the win over Greece, scoring 13 points and making six of seven shots. He was named the player of the game. Though having Rondo’s championship experience would have been a luxury for Coach Mike Krzyzewski and Co., his departure shouldn’t affect the squad too much. It’s addition by subtraction.